Wow! What a fun time we had seeing you all at the first Lincoln Haymarket Farmer’s Market of 2016. There were a lot of things going on downtown Saturday – from an Air Show, to UNL commencement, to a softball game. Thanks to everyone who came down to brave the crowds. Here’s a tip I was given – if you are coming to the market on a busy day like Saturday, aim for the parking garages south of the farmer’s market since they aren’t as full as the ones closer to the Arena. That’s a great basket for the farmer’s market – it looked even better walking away full of beets and lettuce! We had a lot of great produce and it was fun to see everyone gobble it up! I had two wonderful helpers who helped me get some great pictures of our produce and set everything up. They were rewarded with cucumbers and canolis – the two essentials “Cs” of the Farmer’s Market. If you missed us last weekend, no worries. You have several more chances to come visit. We were happy to see all the faces of old and meet some new ones too. See you soon! We had hoped that the warm weather last week would dry everything off enough that we could get all of our broccoli, cabbage, and kohlrabi plants out. Remember, we have a new transplanter that held great promise. In our consistently optimistic minds, we thought that we could plant 22,500 plants in less than a day. Well, we didn’t really figure in all the time we would spend on the ground. We actually probably spent more time laying underneath the machine trying to figure out what needed to be adjusted than actually planting on Thursday. Thankfully, we seemed to get it figured out (mostly) by Friday early afternoon. We put most of the plants out that day and evening. Our sunburns are either evidence of the many hours we spent outside on these nice warm planting days or evidence that we did not reapply sunscreen enough times. The plants looked a little sad on a warm, windy transplanting day, but don’t worry – they have since caught almost an inch of rain! After having nearly 6 inches of rain fall over a period of a week and a half, things got a little soggy around here. So we’ve been playing a little bit of the hurry up and wait game. We’ve had 7 hay racks full of plants waiting to go outside for a week, so the rain gave us a chance to get the new-to-us transplanter ready to go. We’ve had a two row transplanter in the past, but it required 2 people per row and one driver plus one person following. This year we are going to use the carousel transplanter, which goes around in circles as the name suggests. Stay tuned later this week to find out how it worked! 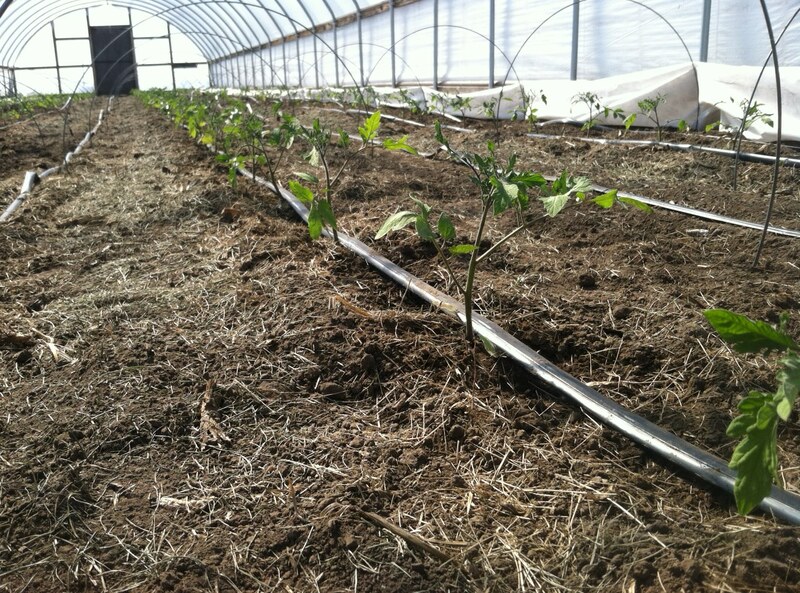 We also got a little anxious and went ahead and “mudded in” some more tomato plants in the high tunnel. The little metal hoops give us a place to put the white “blanket” at night so that the tomato plants stay warm. Don’t forget, Mother’s Day is coming soon – THIS SUNDAY to be specific. Does your mom want a weekly bag of vegetables? Get one in the Pekarek’s Produce CSA!